There I stood, pressed against the glass floor to ceiling window at the top of the Guinness Storehouse. I was totally zoning out, trying to drown the crowd behind me with the “dark stuff” and a remarkable view of Dublin. I peered off into the night sky, blanketed by brown clouds that seemed just low enough to soften the city. My eyes scanned the shadows tracing down streets, around corners and puddles that bounced sparkling reflections of light. I was determined to see something -unusual. Something like a vampire. Something like Bram Stoker’s Dracula. The legendary Victorian vamp has transcended decades and made his way into pop culture media -adored by the masses. Now more than ever, vampire enthusiasts are tuning in and turning pages to popular bloodletting, romanticized-Goth, action-packed vampire novels. I’d be willing to bet that most adults know who Dracula is, and every neck-biting fan knows who Bram Stoker is. That said, did you know he was a Dubliner? True story! Bram Stoker was born in the seaside Dublin suburb of Clontarf in 1847 although he spent most his life in Dublin city. It was there that he left a massive bite in the Victorian-era -which surprisingly has been pretty well-preserved today. They don’t call Dublin the “City of Literature” for nothing. Dublin takes its famous works very seriously. Now most of you know this place as one of my favorite cities in the world. I couldn’t think of a better destination to claim homage to the father of Gothic-vampire subculture. So, after a few trips to Ireland I have come up with a sweet Bram Stoker trail for you to enjoy. You can catch a cab (but that would be outrageously pricey), rent a car (but driving in Dublin is straight bananas), or my personal favorite, get chauffeured in style with Blacklane Limousine’s Service in Dublin. Where He Went to School – Trinity College where he studied and received his B.A. in Mathematics and was an athlete. Where he Worked – Dublin Castle, where Bram Stoker worked as a civil servant. Where He Started a Long and Famous Friendship – The Shelbourne Hotel, where he and Henry Irving started their friendship over dinner. Where He Found Inspiration for His Novel – Beneath St. Michan’s Church in the crypts, home to the mummified remains of soldiers and wealthy families. You can visit the crypts today. The Fairytale Traveler did! Read the Fairytale Traveler Report on the St. Michan’s Mummies here. Bram’s Cafe – Bram took a bite out of Clontarf and you can take a bite at Bram’s Cafe! St. Stephen’s Green – A cool statue of Oscar Wilde, from whom he stole his future wife from. Irish Writer’s Centre – A painting of Bram Stoker can be found here. Bram Stoker Hotel / Stoker Dracula Organisation – Home to the Stoker Dracula Organisation, this lovely property houses the Stoker Dracula Centre. The Centre features artifacts, a visual screen presentation and scheduled “Classic Nights” in the 21 seated Victorian-styled cinema. I have never been to this place but it looks lovely online. The Stoker Dracula Organisation runs out of the hotel. Dublin’s Writer’s Museum – Features Bram Stoker, among other famous Irish literary legends. 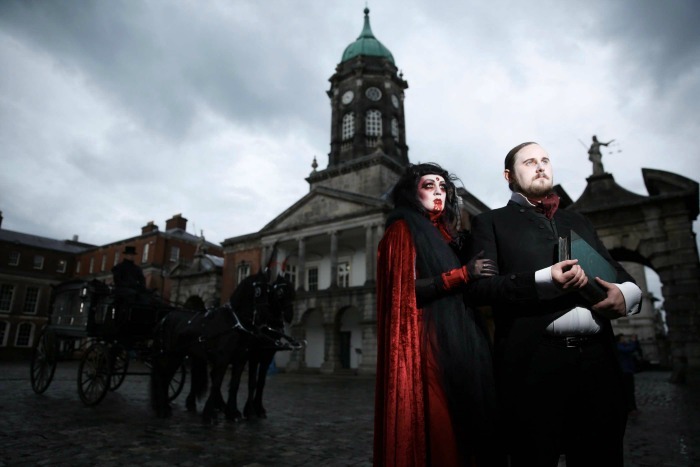 Bram Stoker International Summer School – June 7th-9th, 2014 Vampire Cloak Race – October 31st, 2014 Bram Stoker Festival – Fairytale Traveler and Ireland correspondent, Ed Mooney explored this awesome event in 2013. It was absolutely amazing. This 3 day event calebrates the Gothic culture and literary legend on a whole other level. This year’s festival runs October 24th-27th 2014. Click here for a sample of last year’s brochure! This is killer! Read more about the Bram Stoker Festival from the Fairytale Traveler report series here. Great post! I didn’t realize Bram Stoker was born in Dublin. It certainly isn’t common knowledge. I was delighted when I learned this during my studies. Thank you!! I didn’t know that Bram Stoker was a Dubliner either. These locations look so fascinating on their own, especially that library at Trinity College, that the Stoker association is a bonus way of tying them all together. Those mummies are so creepy. I can see how they inspired the story of Dracula.